Like most of the best stories, it started with quitting my job, buying a one-way ticket and flying somewhere thousands of miles away from home. I’d always wanted to go to India, and I’d always thrived off the challenge to push myself physically and mentally more than ever before. I went crazy in the anticipation, I became hooked on the unknown, ‘Through security, on the plane, heart still in my throat as I hurtled down the runway, I look out the window towards the only familiar world I knew passing rapidly by in the drizzling English winter… I take a last deep breath, close my eyes, and lift up into the air. 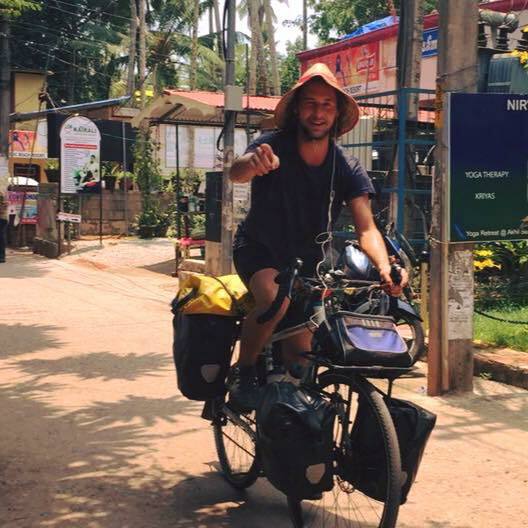 I’m on my way to India.’ This was the start of my epic cycling adventure on the other side of the world. 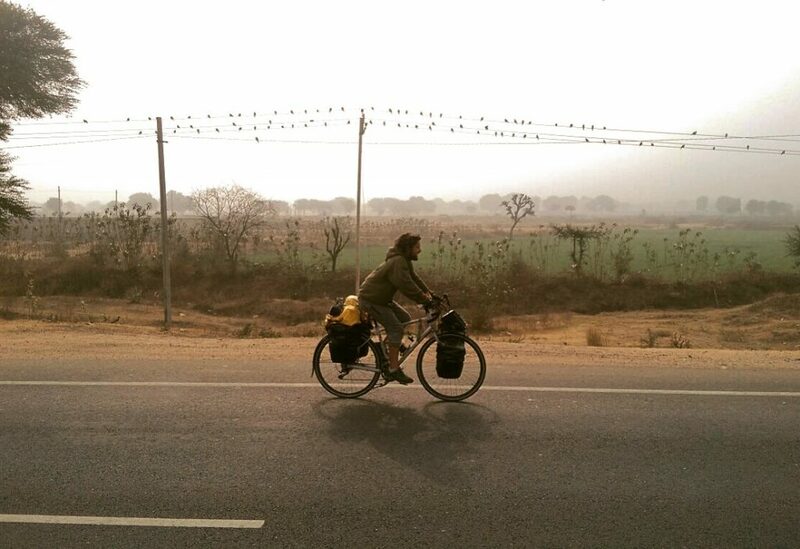 After landing in New Delhi, I got my bike on a bus and headed north. I started my journey in Manali, in the northern state of Himachal Pradesh, a place of glorious natural scenery and remote mountain villages nestled into the sleeve of the great Himalayas. From there my journey would take me south through twelve states, over 4,500km, several crashes and some truly impressive tan lines. 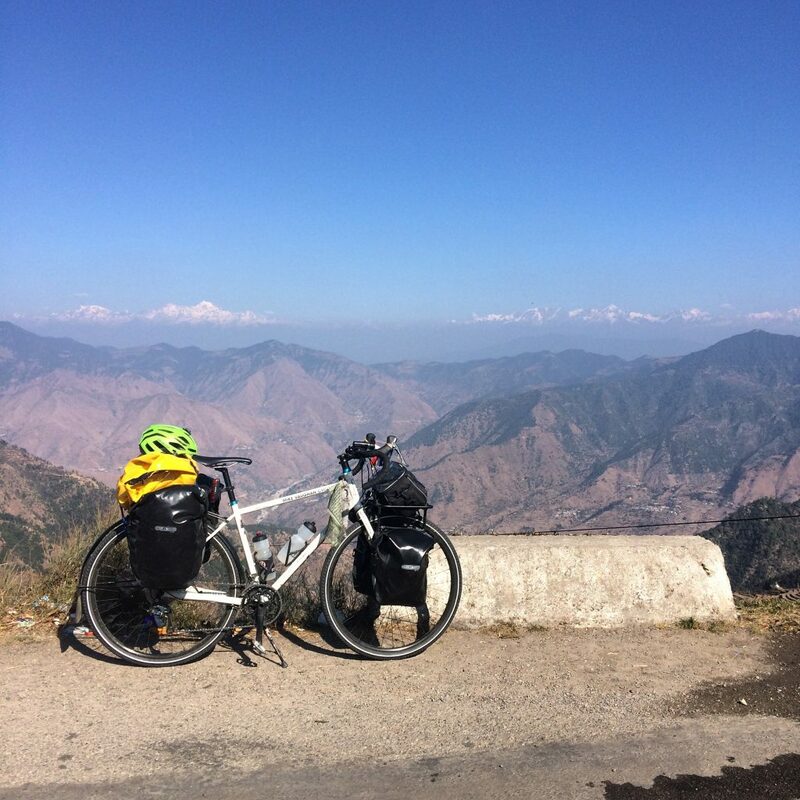 Starting my ride in the north of India was a great opportunity to test my legs and courage through the mountains. The tracks were steep and never ending, taking me through forests, ravines, old mining towns and over high-mountain passes. The locals were incredibly happy to see me and helpful whenever I had needed it. On the second day of riding, a group of locals traveling on the roof of a four-by-four offered me a lift while on an impossibly steep mountain road as they heaved my fully loaded (40kg) Specialized Awol Elite touring bike into their truck and invited me to sit on the roof as they slowly bound their way up the mountain. I spent a few more weeks tracing some the highest mountain roads, crossing into the north east state, Utturakand on the boarders of Nepal where I decided to commit to the grueling accent to Auli, a small mountain town with a panaoramic view of Nandi Devi, otherwise known as K2, the second highest mountain in the world, temperatures around here dropped to –10 degrees making decents bitterly cold on my hands, feet and knees. 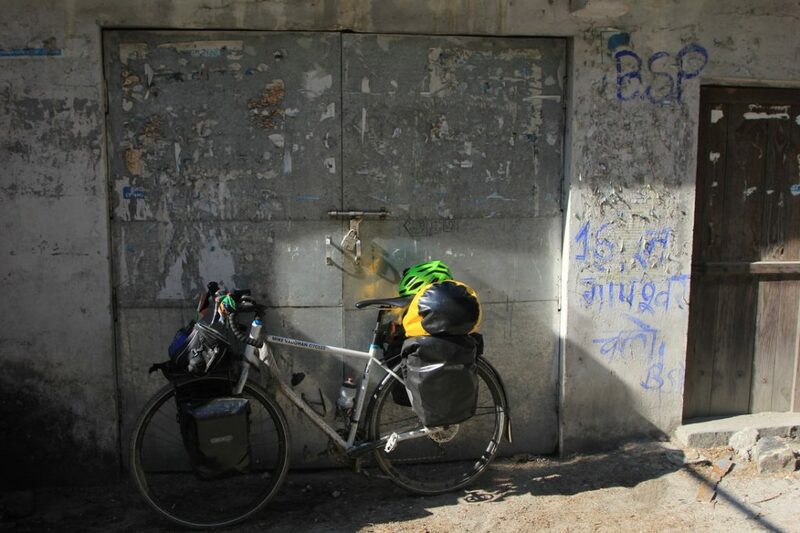 See my first cycling video of North India below. After spending some time in the popular hippie town of Rishikesh also known as the gateway of the Himalayas, I left a lot of wonderful friends behind and headed towards Agra, home India’s famous Taj Mahal. 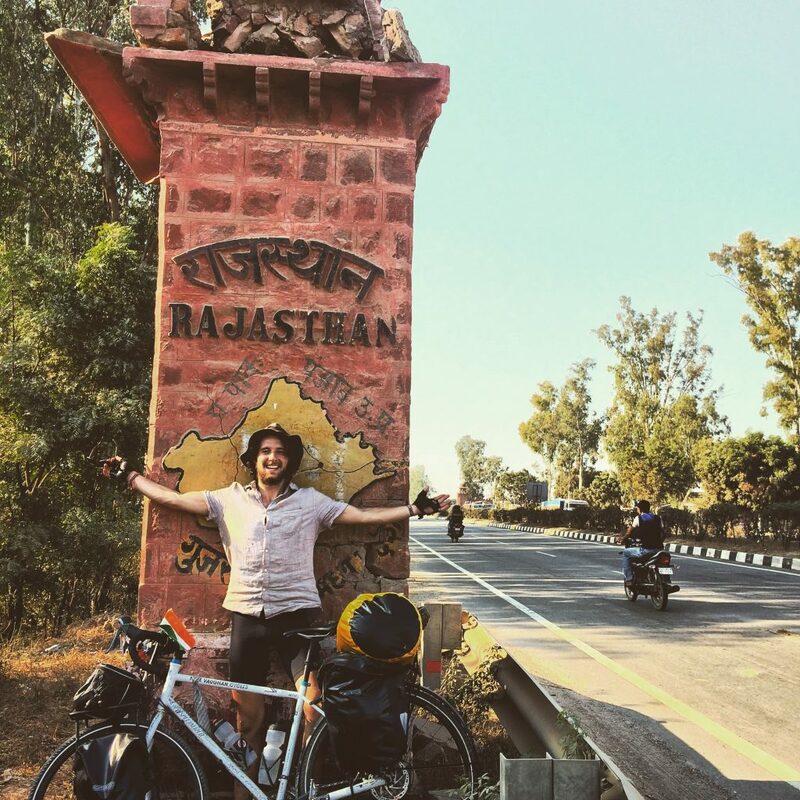 By this point I had covered over 1000km and was starting to fall in love with this two-wheeled way of life as I entered into central India’s dessert state of Rajasthan. This incredibly rich and exciting state provided many challenges but also provided some of the best experiences of the whole journey with its amazing food, crazy festivals and charming people. The roads stretching across this huge state were flat, never ending and tedious on the bike making stops in the small towns along the way even more rewarding. The stretches of land in-between maybe incredibly hot and lonely, but along the way there were several cities where I could kick back and enjoy a few cheap beers with some fellow backpackers, with the additional bonus of sinking into clean, comfy dormitory beds at the end of a long hot day. This was occasionally a nice treat of course as I past through Jaipur (the Pink city), Puskar and Udaipur (The Venice of the East), but these places were far and in-between. 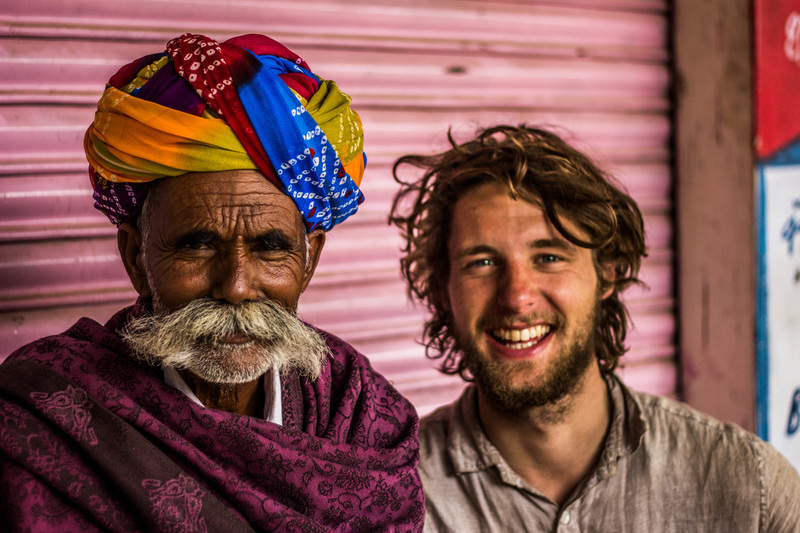 The real Rajasthan was a harsh yet rewarding reality and became somewhere that I thrived off this difficult challenge of pushing nearly 40kg of weight over 100km a day in the blistering heat with a tired, thinning body. See the second video below. ‘That was me. Dust in the eyes, darkened eyes lids, skin parched dark brown from months under the sun, a fruit fly stuck to my forehead with sweat, several in a greasy main of hair grown thick and knotted resting on the stifling head of an idealist 23-year-old out on the road’. 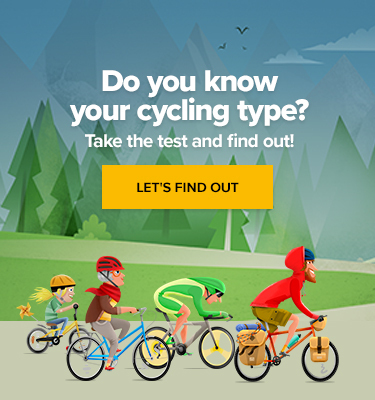 One of the many things that would excite me during the days in the saddle was ‘where would I sleep?’. Camping wherever I could made it a real adventure, on roadsides, in peoples gardens and in the expensive hotel grounds. Several nights were spent in local peoples houses whose warming and accommodating nature would take me in, fill me with copious amounts of rice and Dahl (a common lentil based curry) and often invited to meet all their families in the surrounding villages. After the long crossing through Rajasthan and the grueling push towards through the dry state of Maharastra with its busy and very dangerous highways I was on my way to Mumbai, India’s financial capital. 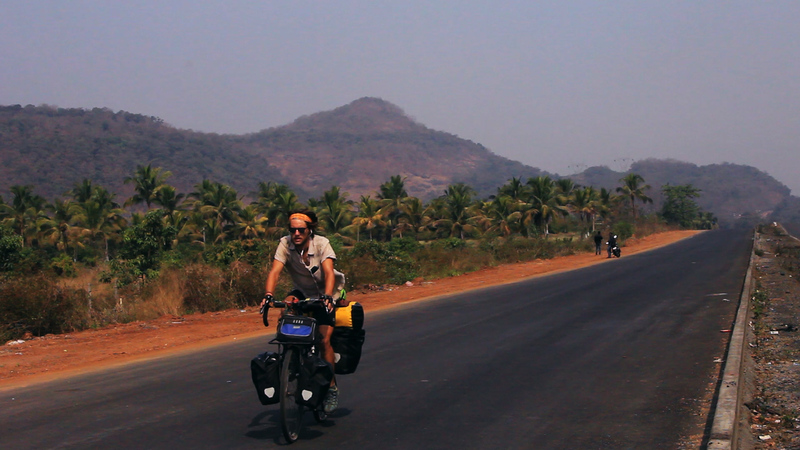 Making it to Mumbai was major milestone in my journey. 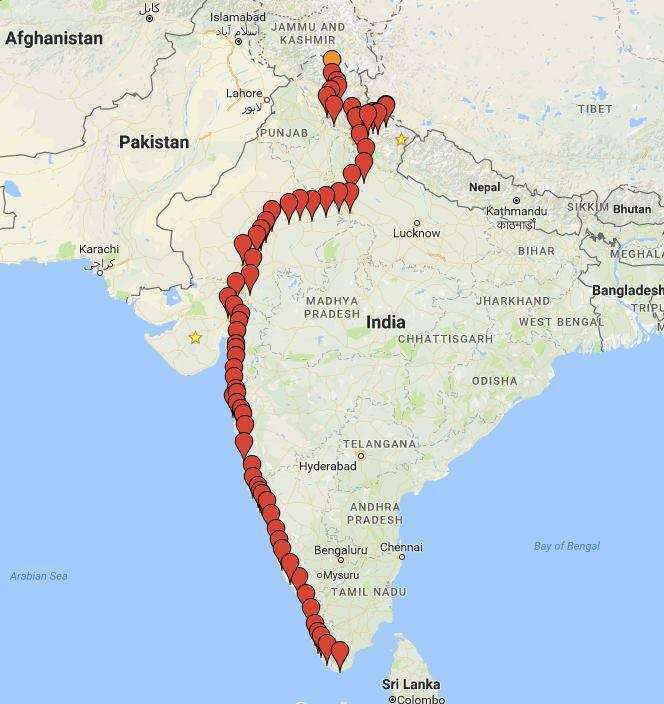 It meant that I had crossed north and central India, covering over 2,000km and on the last, very long, and very winding leg of the adventure, I was finally on the road to the south. Cycling down over 1,500km down the west coastline and seeing the sun dip over the Indian ocean most days was a thoroughly enjoyable route. I passed through the magical tropics of Goa and Kerala, through dense jungle and burning roads shaded occasionally with leaning palm trees and coconut groves. What wasn’t so pleasant was the sheer heat as I cycled into Kerala in the hottest month of the year where temperatures soared to 38 degrees and humidity pushed 80%. 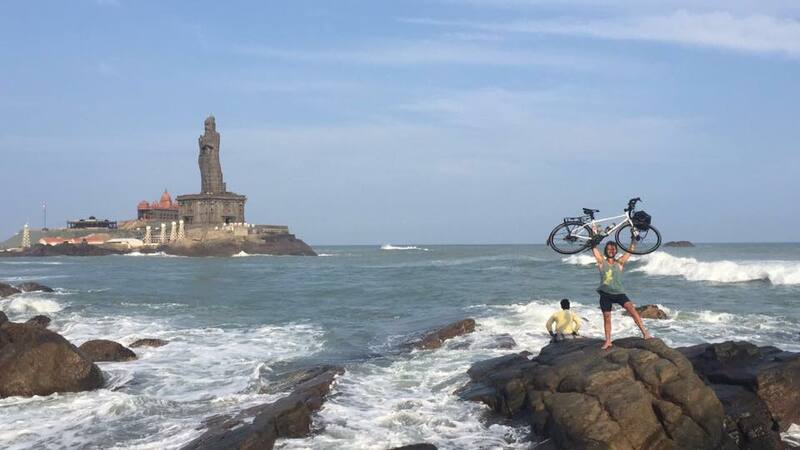 Despite drinking up to ten liters of water a day and eating upwards of 4,000 calories a day I lost a lot of weight as I approached Kanyakumari, India’s most southerly point before the bridge of water that separates India from Sri Lanka. 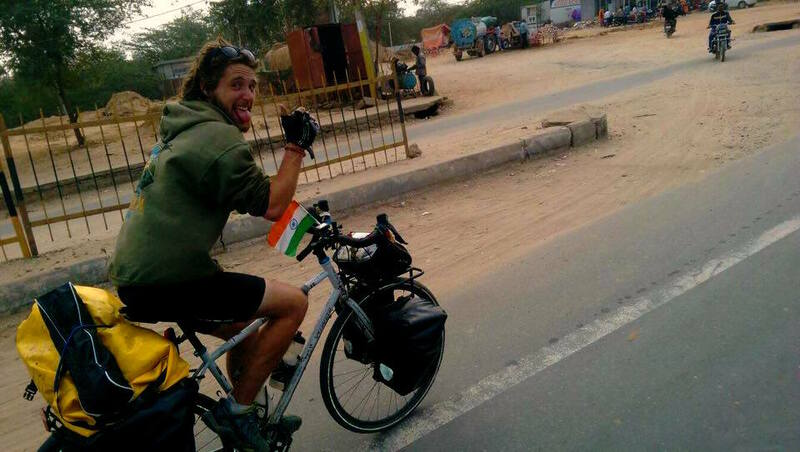 Six months after I started cycling I had made it to end of India, and I feeling on top of the world! See the final video below. In my zest for adventure I agreed to turn my back on security, comfort, good money, from the arms of assured success and from predictability. I chose the road less traveled, I set my goals sky high and jumped into the unknown. I’d like to use this adventure and the videos I made to ultimately inspire people to take up new challenges, travel, make radical changes in their lives and be a reminder to people not to live their lives vicariously, but to instigate the adventurous life which is in all of us.